Renewal of the mind, body and spirit is what one will find at The Spring Resort. Views of beautiful Palm Springs or breathtaking surrounding mountains enrich the peaceful experience on Miracle Hill. Soak away in one of 3 hot mineral pools, further rejuvenate with a massage or body treatment. Once the day is over, sleep the night away in one of the many luxurious relaxing guest rooms. Bathe in starlit skies or feel the breeze dance across your skin while feeling the stress seep away in one of The Spring Resort’s natural mineral hot springs. 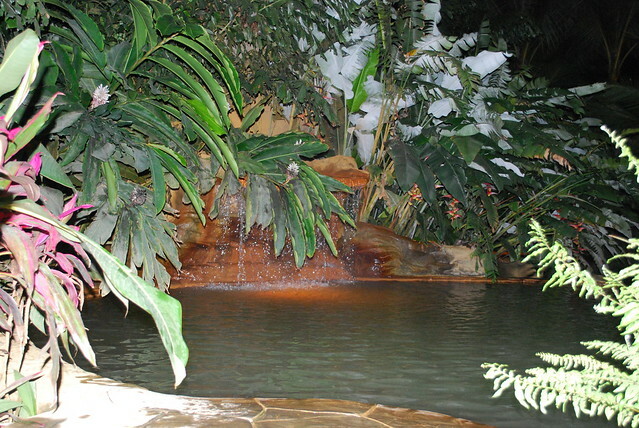 Rich in silica, the hot springs help leave your skin silky smooth. Before or after your soak, enhance the moment with a full body exfoliation or massage. Stay for the day or multiple nights, but be sure to make reservations first. Find everything you need in the “liquid bliss” to renew from the inside out. The Spring also offers a variety of packages to suit your whims. Wrap yourself in 100% Egyptian Cotton sheets when you lay your head down at night. During the day, relax on the veranda outside of your room. The Spring Resort and Day Spa offers 12 unique rooms, the Courtyard Suite or Mountain View Suite, along with the Desert Villa a short ways off the main property. Enjoy a leisurely breakfast in your own fully equipped Cafe kitchen, adorned in a soft premier quality robe and slippers. Take advantage of grocery delivery service, and unwind to your own soft music playing on the provided cd/mp3 player doc in your room. Lush amenities and pristine atmosphere intensify the revitalization experience. Located in the beautiful city of Desert Hot Springs. Head East on Pierson Blvd, continuing onto Miracle Hill Road. Turn Left onto Desert View Avenue. Take your second Right on Reposa Way. You’ll find The Spring Resort on your right!